Here at WTF we try to keep from getting political, but we believe that good wine is good wine, no matter where you are on the spectrum. So when Nasty Woman Wines sent us three wines to review a couple months back, we pledged to take a non-partisan standpoint on it, and it did not disappoint! We had a spring soiree at our apartment this past Saturday night, and decided to serve Nasty Woman Wines as the first round (you always save the best for first when it comes to drinking wine at a party). Andrew, Kathleen and I did a little pre-tasting prior to the event with the help of our friend Adrienne. Here’s what the four of us found. The Inaugural "Pave the Way" Chardonnay had a distinct nose of preserved lemon, green apple, and fresh pretzel bread. Sidenote: if you don’t know what preserved lemon is (one member of the trio did not, and his name wasn’t Meghan or Kathleen…) then you should definitely look into that because it is delicious in recipes. It is not the same thing as lemon preserves! In keeping with the nose, there was granny smith apple on the palette with a little buttery brioche on the finish. This Chardonnay was balanced and not overly buttery, so it was easy to drink. In general, Chardonnay – especially West Coast Chardonnay is not our favorite, but we can appreciate when one is good. If you do like Chardonnay, and you’re looking for a good bottle in the $30 range, we would definitely recommend this! "Pantsuit" Pinot Noir was truly our favorite of the lineup. Those who have worked with me in my professional life outside of Wine:Thirty Flight know that I’ve had a general aversion to pantsuits for most of my career. In the last few months though, my friend/mentor/former boss Martina has encouraged me to get my pantsuit on. Similar to my surprise that I recently bought a pantsuit, this Pinot Noir surprised us with how bold it was, given the winemaking region from which it hails. I think this will become a regular in our lineup at home and for recommendations. This Pinot Noir was complex and dark – the perfect combination of earthy and jammy. The nose changed over the first 60 seconds we spent with it, and had strawberry, raspberry and a little bit of fresh green pepper. The palette followed suit with rich blackberry jam, with hints of cocoa and an earthiness that followed through from start to finish, complementing the fruitiness well. The website’s description was also on point with "this wine is not meant to be silent; she will be heard. Her deep garnet color leads the way to a brambly nose…" I must admit that I had wandered off to work on appetizers and wasn’t quite paying attention when Andrew, Kathleen and Adrienne tasted this one. They all demanded that I stop what I was doing in order to join them and get the full experience! It’s also possible that there may have been some hoarding of the Pinot Noir in our glasses prior to the guests arriving . We think it was absolutely worth the $25 price point... actually, we thought this was their $40 Pinot Noir, so we'd say the Pantsuit performs much better than its $25 sticker price. There are a few other bottles available on their website – including "Boss Lady Bubbles", which I can’t wait to try. I’m a lady, a boss, and I love bubbles, so it was pretty much made for me. At the end of the day, we feel positive about recommending Nasty Woman Wines, even though the name might connote a specific political leaning. 20% of the net profits from this wine go to help accelerate global progress towards women’s equal participation in policy and leadership. With my degree in Political Science and Andrew’s degree in Government, that’s definitely a cause we can get behind! We look forward to seeing what they do next. 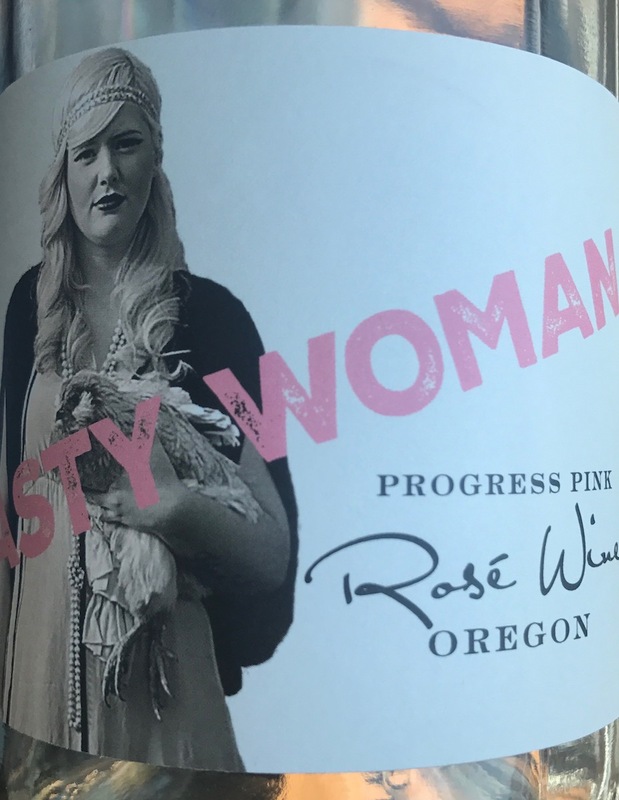 Nasty Woman Wines can be found at https://www.nastywomanwines.com/. Follow them on Facebook, Twitter, and Instagram at @nastywomanwines.